Kentish Town station is not step-free, as these pictures show. This Google Map shows the layout of the station. Note the four platforms and two extra tracks on the Southern side. But I do believe it is a station with potential. In perhaps 2022 or a couple of years later, when the new bi-mode trains are delivered, between Kentish Town and St. Pancras stations will be an all-electric railway. The station is in a cutting and given the price of land in the area and the demand for housing, I wouldn’t be surprised to see the whole station roofed over at some time in the future. This couldn’t be done until the railway was all-electric. 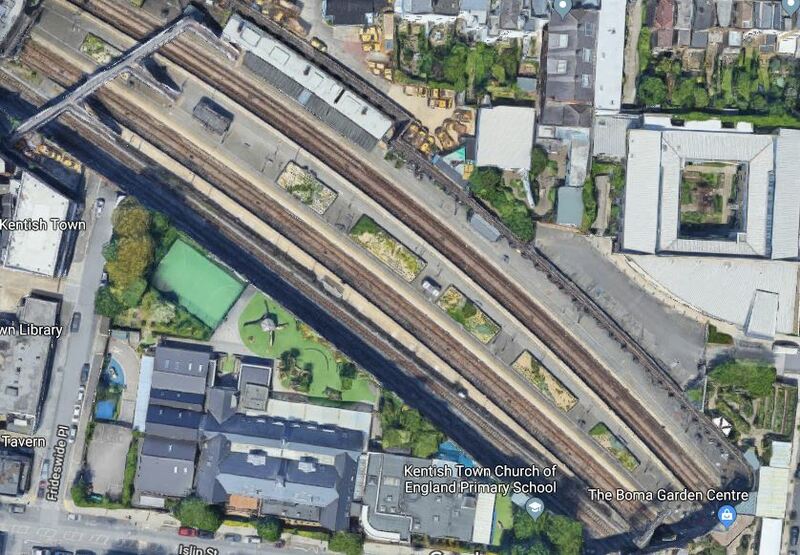 If the station was covered by development, I’m sure it would be possible to provide step-free access between the surface and the National Rail platforms. This map from carto.metro.free.fr shows the lines at Kentish Town station. Note how the Northern Line is at almost right angles to the Midland Main Line. Providing step-free access might be easier from the area to the North of the current Undegrround station, which could be within any new development. Some of the new techniques used on Crossrail might make a connection possible. The next station to the North of Kentish Town is West Hampstead Thameslink. Both stations have six tracks, but only four platforms. It would probably be very advantageous if there were six tracks on the Midland Main Line along this very busy railway. But this is impossible as the tunnels that lie between the two stations only have a total of four tracks. I suspect that Network Rail’s engineers sometimes muse about what might have been, if the Victorians had built the extra tracks. Thameslink services could have their own separate tracks. Express services could be roaring through at 200 kph. The West London Orbital Railway could terminate at Kentish Town station. But short of rebuilding the Midland Main Line between the two station and digging a lot of extra tunnels, these are impossible ideas. When Mayor Khan announced his plans to improve access to the underground questions were raised re Kentish Town (Northern Line) Station but it was said that making that Station accessible would be difficult and expensive. I it make more sense to make this Overground Station step free both because it would be far cheaper and by chance the Thameslink services which use this Station follow the Northern Line to Kings Cross and London Bridge Stations thus providing much easier links for disabled users with major accessibility benefits at both these stations as well as route to Farringdon and Blackfriars for tge City of London.